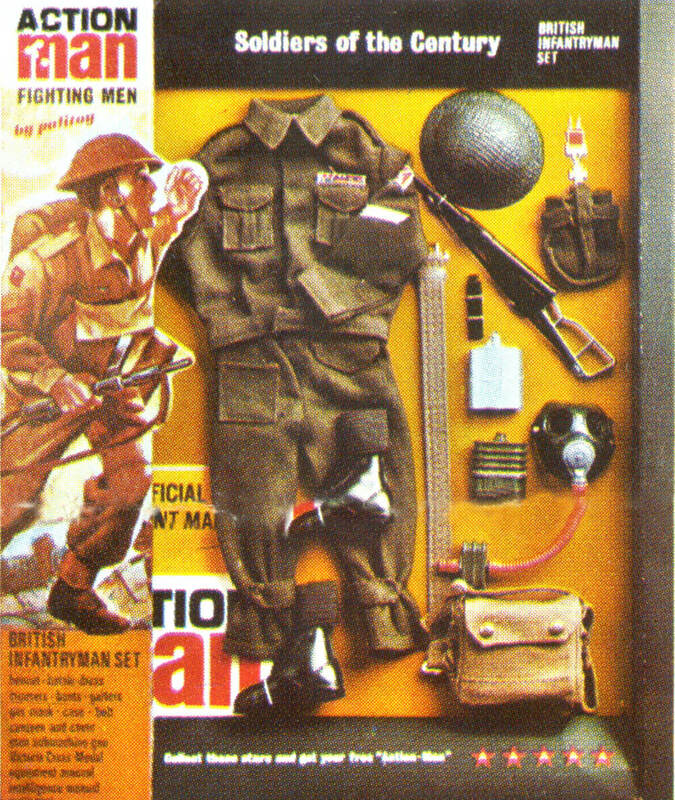 ACTION MAN BRITISH INFANTRYMAN SET: Tunic and trousers ('Battledress'), boots (lace-up), helmet, belt (with slider), gaiters (elastic), gas mask, Sten sub machine gun (elastic strap) and clip, Canteen and cover, Victoria Cross Medal, Intelligence Manual, Equipment Manual. 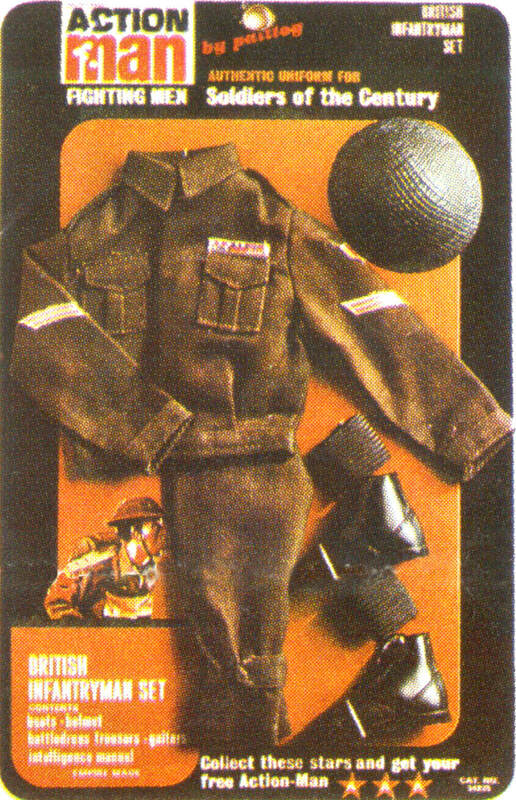 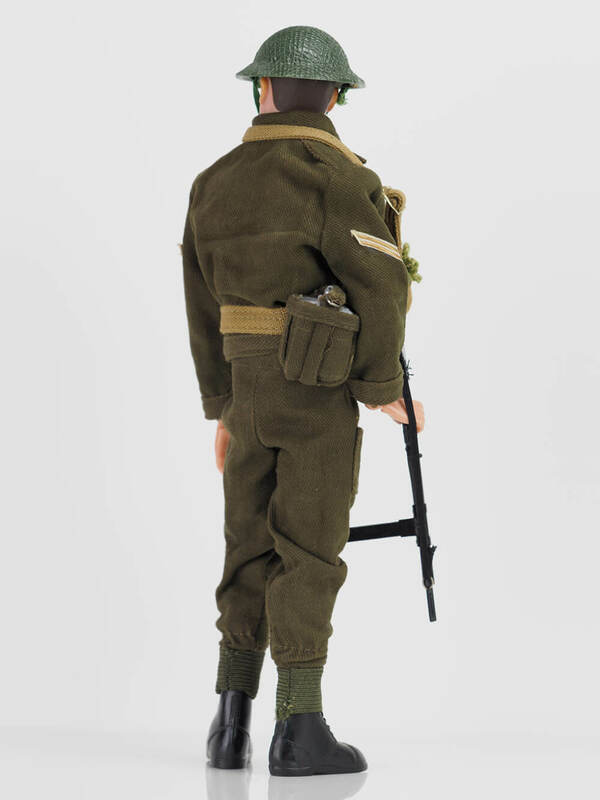 ACTION MAN BRITISH INFANTRYMAN UNIFORM: Tunic and trousers ('Battledress'), helmet, gaiters, boots. 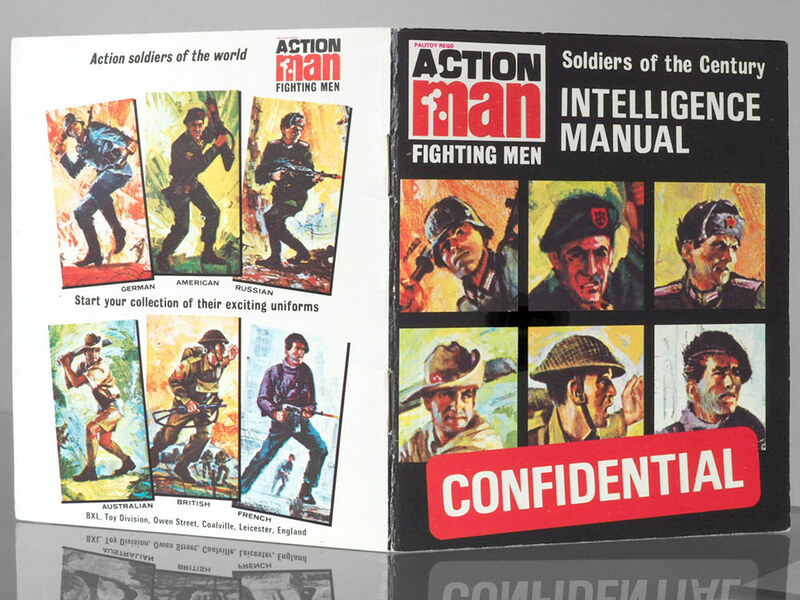 Intelligence Manual, Equipment Manual. 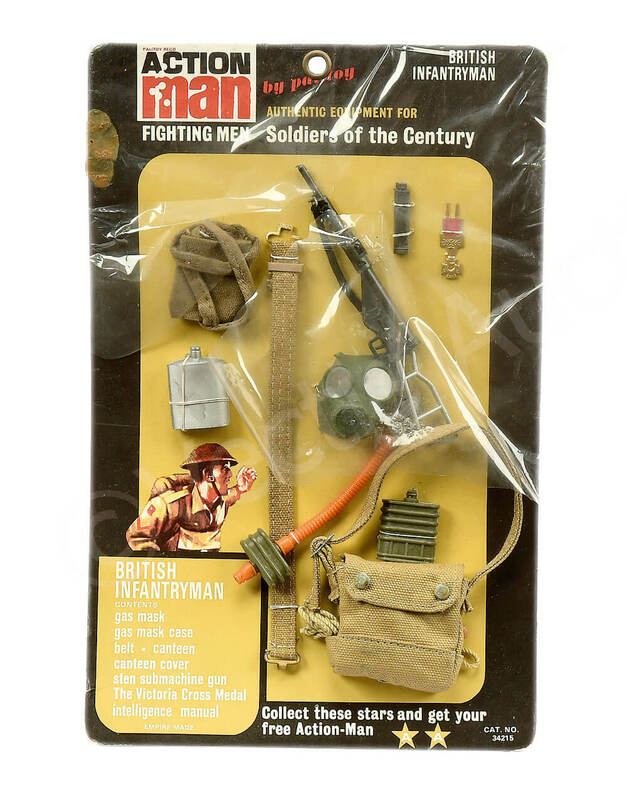 ACTION MAN BRITISH INFANTRYMAN EQUIPMENT: Gas mask, gas mask bag, belt, canteen, canteen cover, Sten sub machine gun, Victoria Cross Medal. 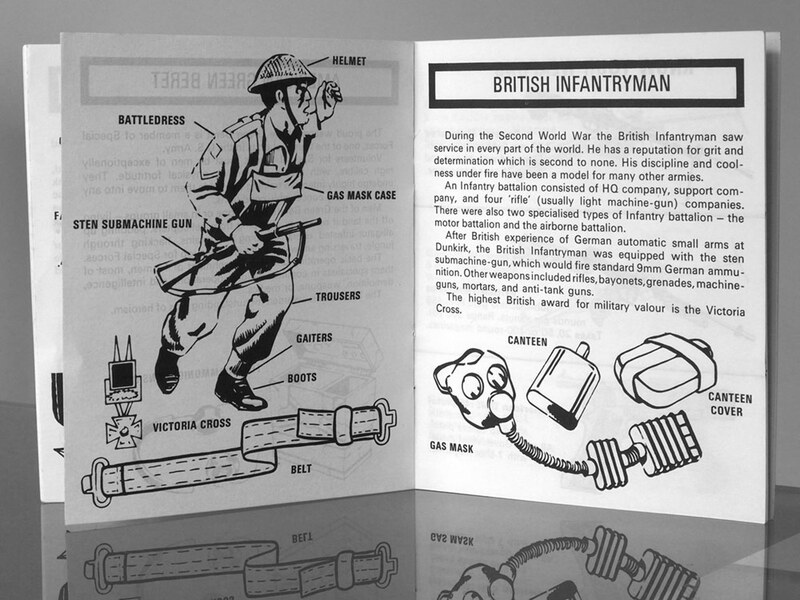 Intelligence Manual, Equipment Manual. 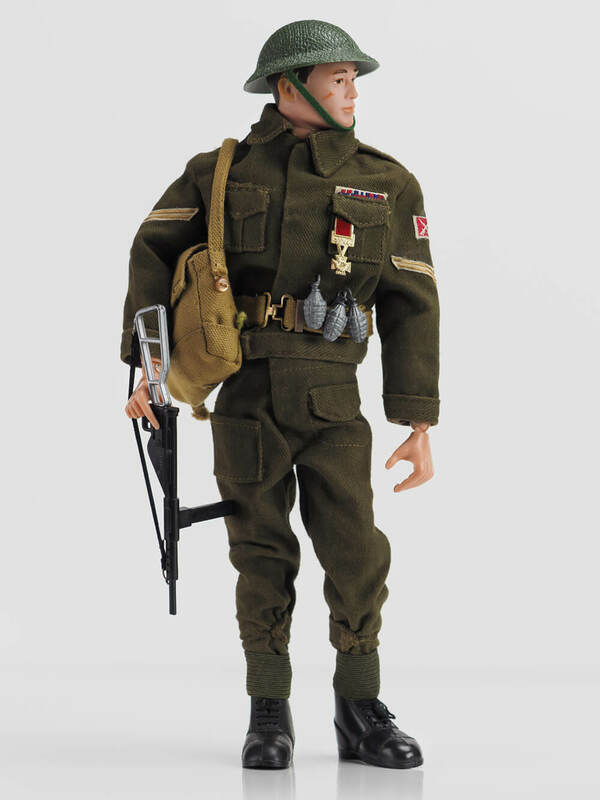 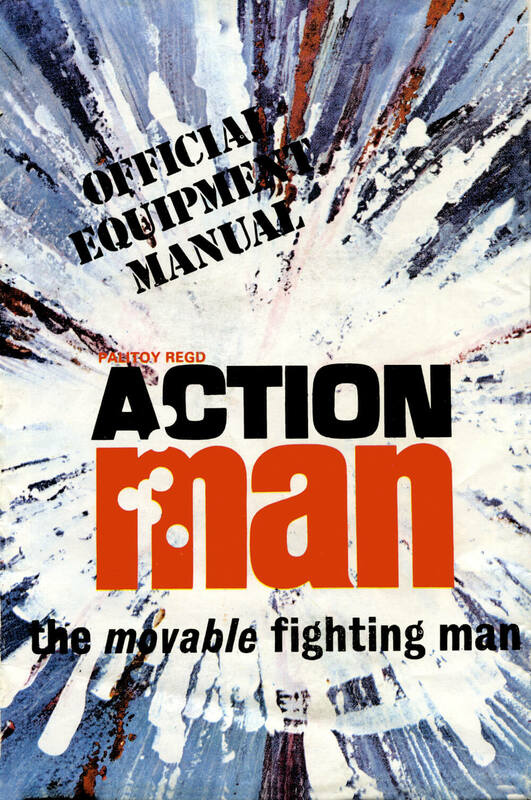 The Action Man British Infantryman was a very popular set, along with the Action Man German Stormtrooper in the Soldiers of the Century (SOTC) range. 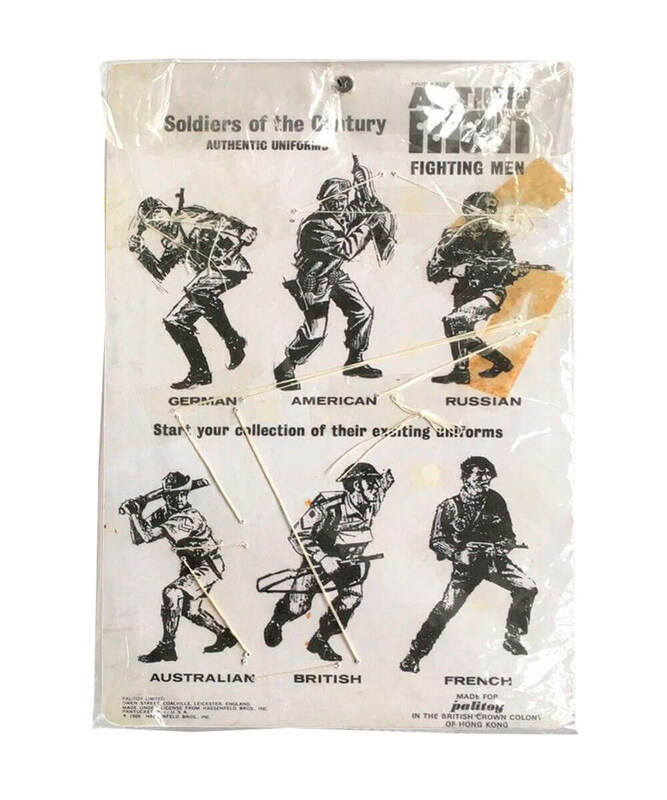 The range ran for many years and became Soldiers of the World (SOTW) in 1973 with slight visual modifications. 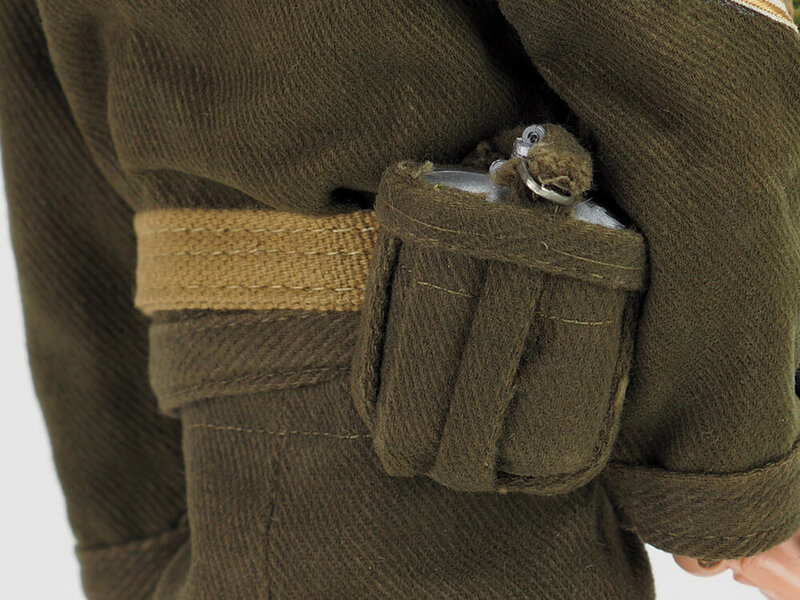 SOTC 1st issue tunics were a heavier cotton drill fabric than the subsequent editions. 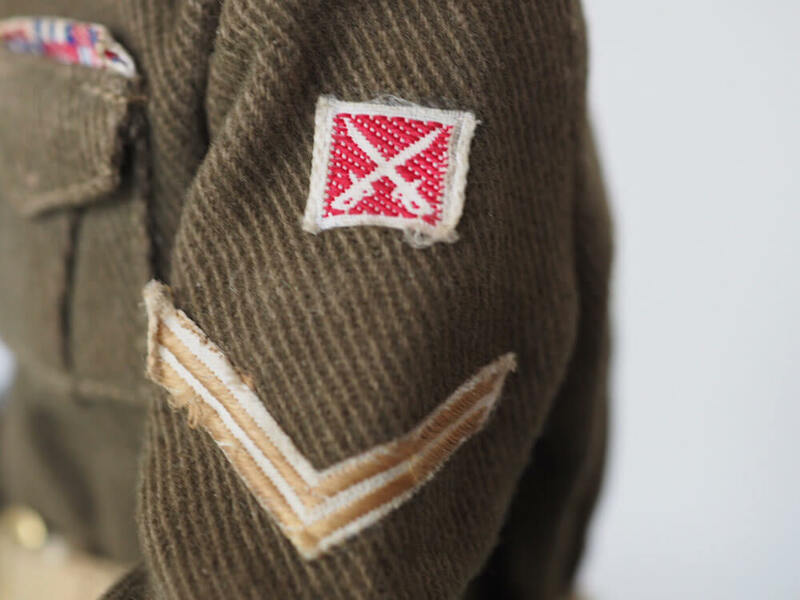 It featured woven insignia rather than later printed. 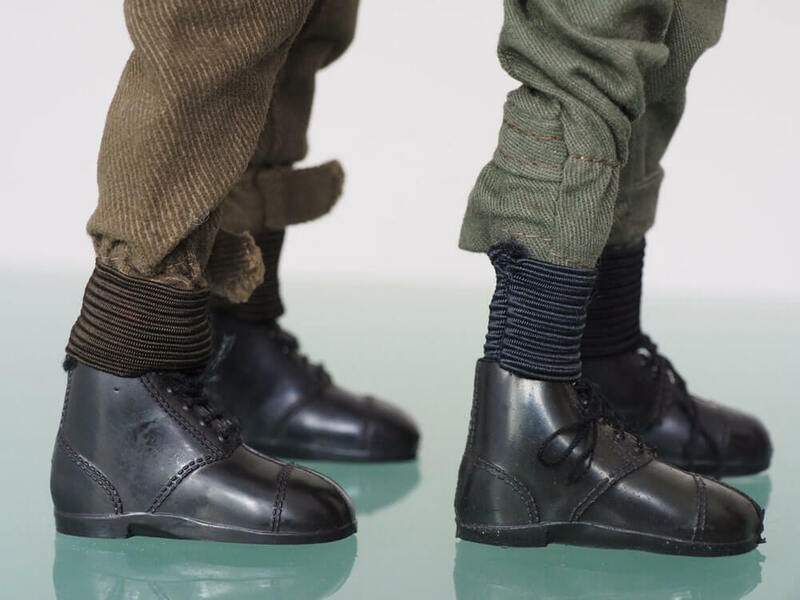 Gaiters generally were khaki/green becoming dark green/black in colour but there is good where exceptions are swopped. 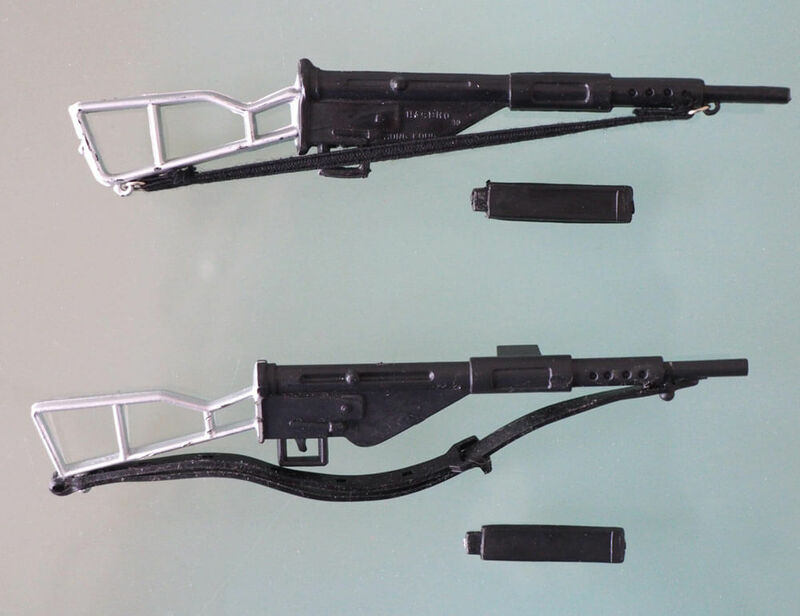 Sten gun had elastic strap and HASBRO HONG KONG molded into surface. 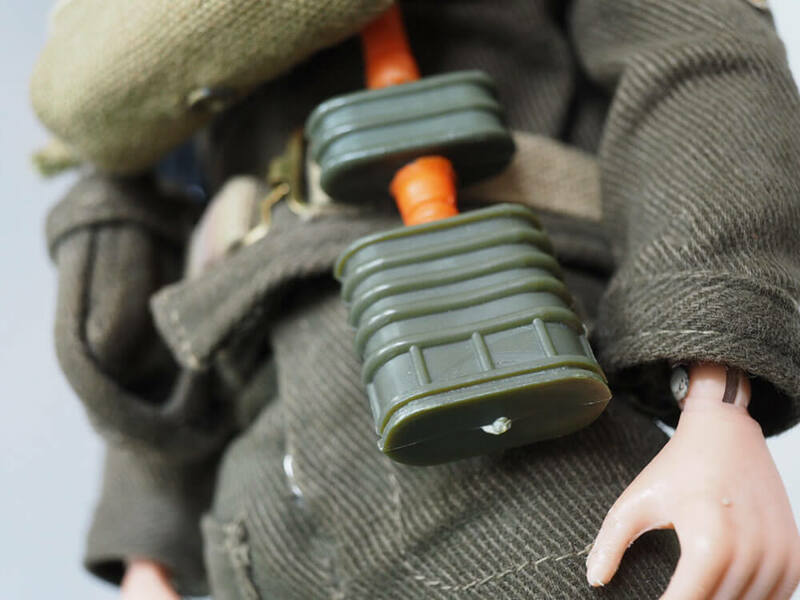 Later were to progress to plastic straps. 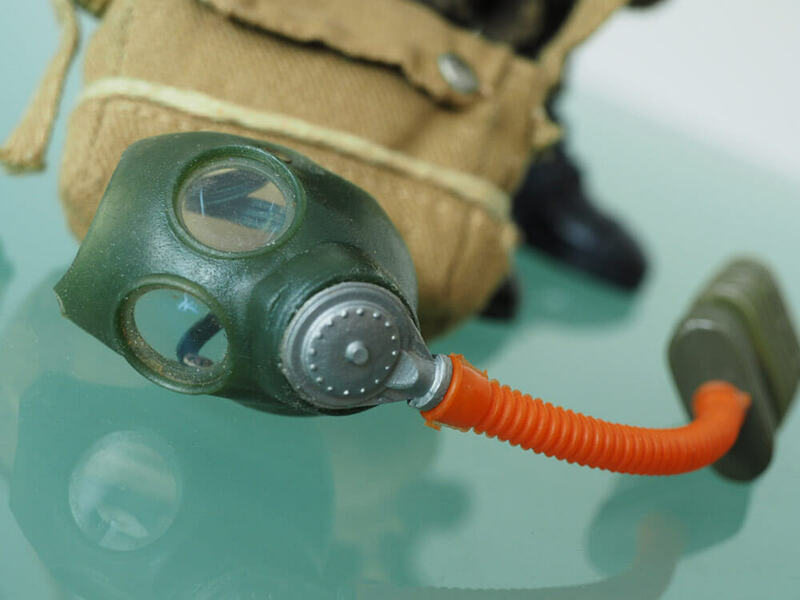 1st issue gas mask had large aperture eye glasses with glazing (subsequent were smaller diameter and late versions dropped the glazing. 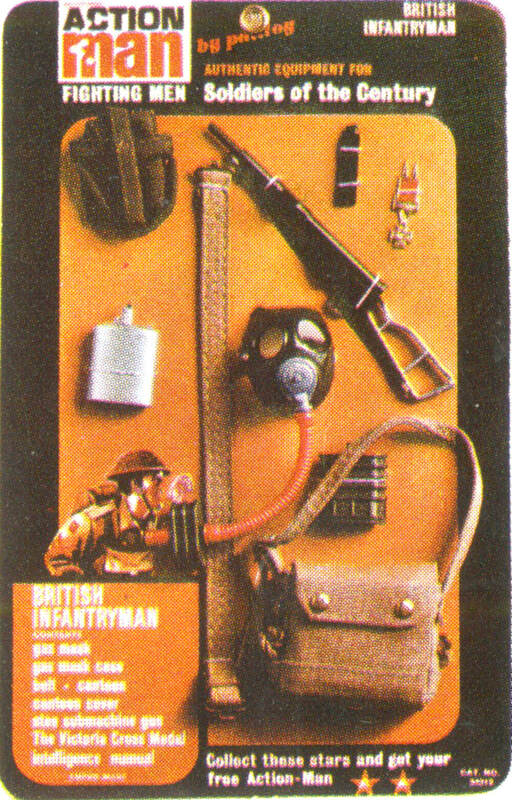 The Sabotage set had a similar gas mask, but had only the end filter cassette. 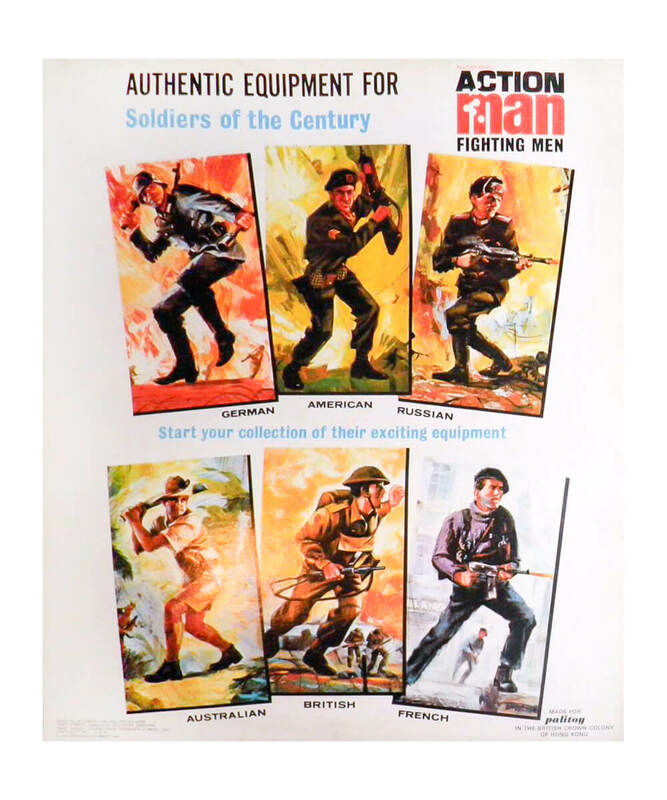 No hand grenades were issued with this set. 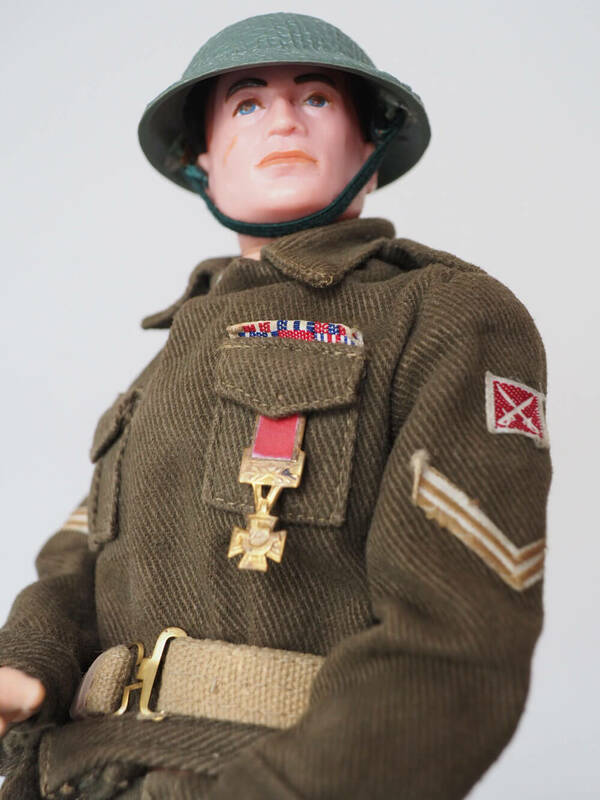 The VC issues with Soldiers of the Century British Infantrymen and Australian Jungle Fighters had much detail and a darker red ribbon sticker. 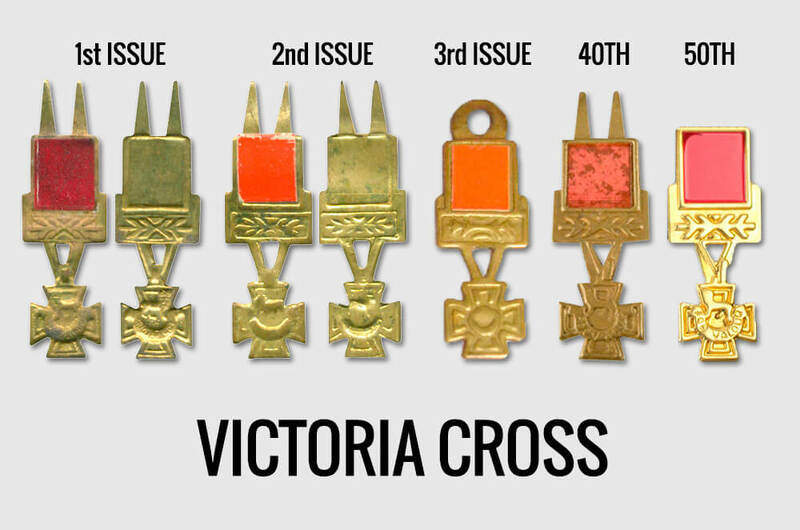 By the time of SOTW issues it would change to a red, and metal pressing deteriorated to noticeably less detail. 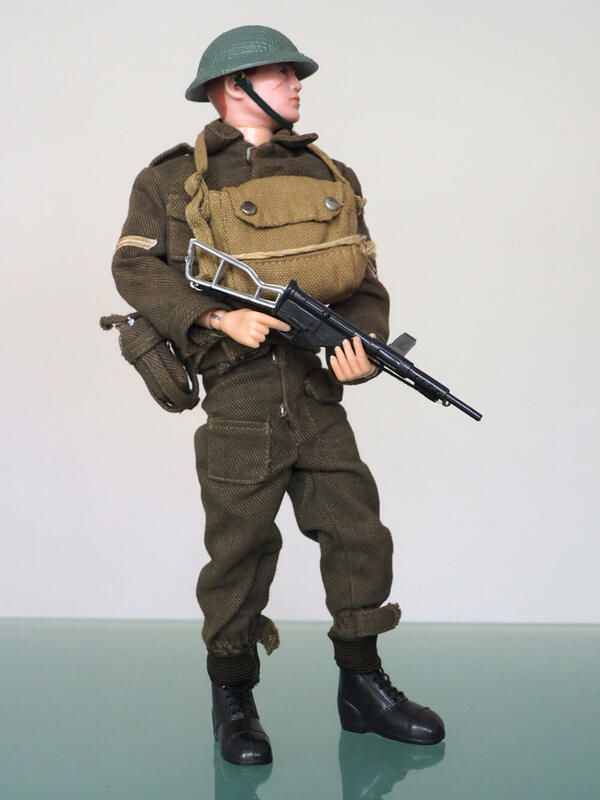 During the years of production many shades of color for the uniform, belt and gas mask bag should be expected. 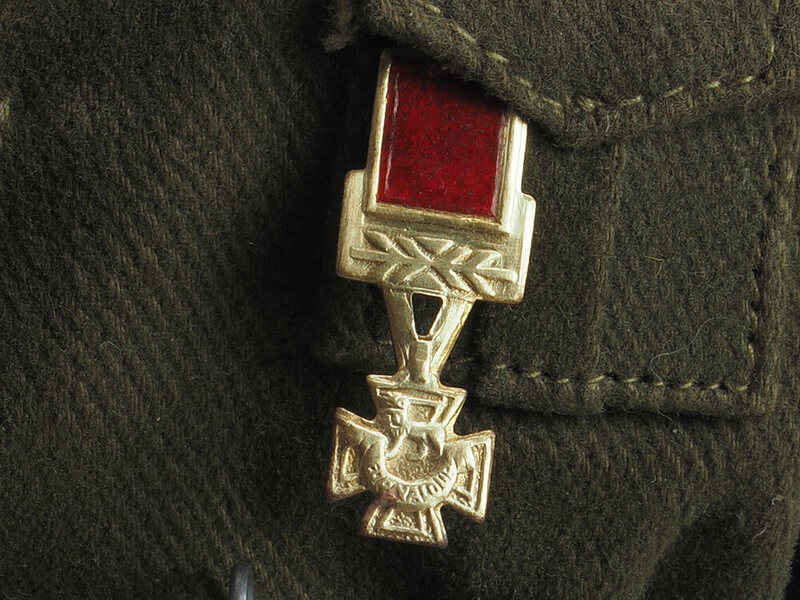 Add to this fading from UV light, and washing, it is a challenge to get a matching set. 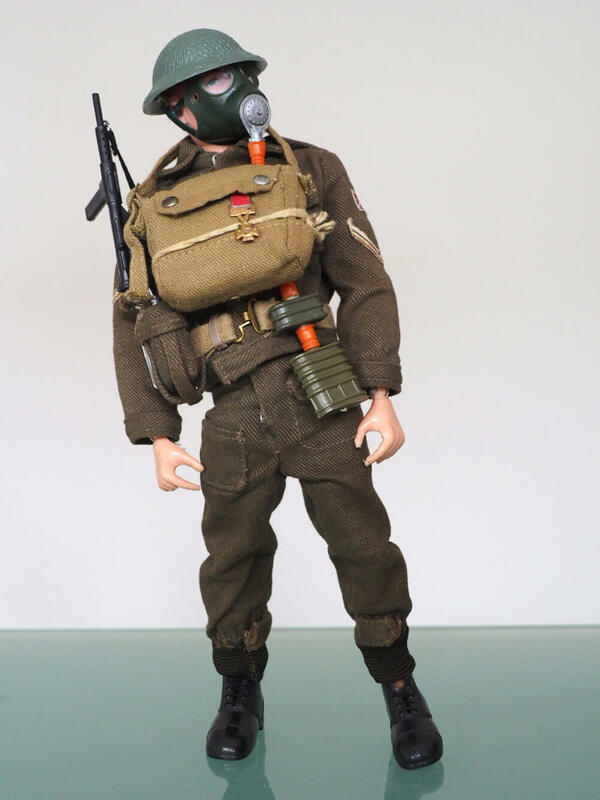 The gas mask bag should be worn on the chest, not over the shoulder. 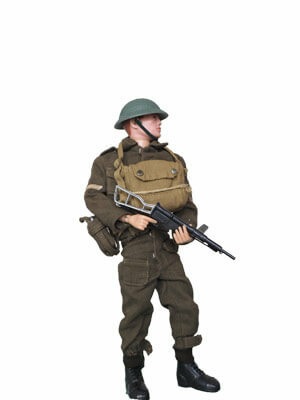 Although not supplied with grenades the US 'pineapple' grenades look good with this figure. 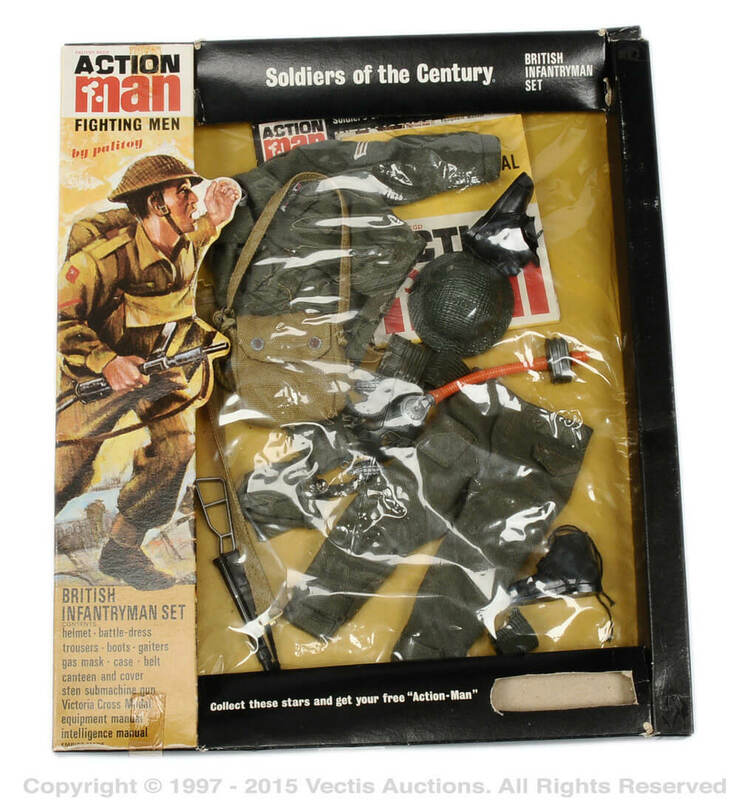 Action Man British Infantryman Gas Mask - twin filters, unlike Sabotage Set.